League Two strugglers Darlington lost their fifth successive league game after being demolished by Torquay. Chris Zebroski volleyed in the first and then set up Wayne Carlisle to double the lead, before Scott Rendell headed in Jake Thomson's corner. United piled on the pressure as Carlisle's hooked shot bounced off the bar for Zebroski to nod in the fourth. Substitute Elliot Benyon made it five when he collected Thomson's cross from the right to volley home from 15 yards. "A real pleasing day, built on hard work and we really did do the the basics right today. "The players got everything they deserved today in my opinion. "The goals are there, we kept a clean sheet and I was pleased for [defender Chris] Robertson." 90:00+1:58 Nicky Wroe gives away a free kick for an unfair challenge on Gary Smith. Jonathan Hogg takes the free kick. 90:00+0:50 Outswinging corner taken from the left by-line by Jeff Smith, Paul Harsley produces a header from deep inside the six-yard box that clears the crossbar. 90:00+0:07 Chris Zebroski takes a shot. Clearance made by Daniel Hall. 88:51 Kevin Nicholson takes a outswinging corner from the right by-line to the near post, save by Nick Liversedge. 87:45 Jake Thomson sends in a cross, save by Nick Liversedge. 86:59 Corner taken left-footed by Kevin Nicholson from the right by-line to the near post, Dan Burn makes a clearance. 85:39 Josh Gray takes a shot. Michael Poke makes a save. 85:07 Free kick awarded for a foul by Paul Harsley on Chris Robertson. Jake Thomson takes the direct free kick. 84:33 Effort from inside the area by Chris Zebroski misses to the left of the goal. 84:12 Mor Diop is ruled offside. Michael Poke takes the indirect free kick. 83:16 Nicky Wroe gives away a free kick for an unfair challenge on Paul Harsley. Paul Harsley restarts play with the free kick. 82:13 Jake Thomson decides to take a short corner. 80:23 Tim Sills fouled by Gary Smith, the ref awards a free kick. Free kick taken by Kieran Charnock. 79:51 Inswinging corner taken by Kevin Nicholson, Jonathan Hogg makes a clearance. Correction - 79:24 Booking The referee cautions Gary Smith for unsporting behaviour. 79:24 Booking The referee cautions Kevin Nicholson for unsporting behaviour. 79:01 Substitution Kevin Nicholson comes on in place of Lee Mansell. 76:06 Jake Thomson provided the assist for the goal. 76:06 GOAL - Elliot Benyon:Torquay 5 - 0 Darlington Elliot Benyon finds the net with a goal from inside the six-yard box to the bottom right corner of the goal. 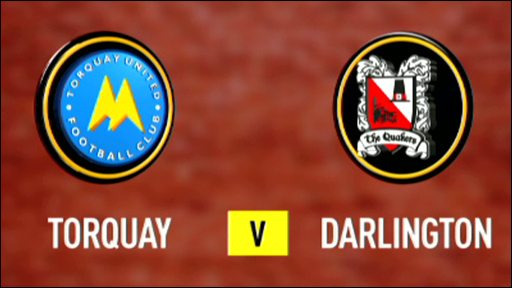 Torquay 5-0 Darlington. 73:29 Jake Thomson takes a outswinging corner. 73:20 Elliot Benyon delivers the ball. 72:30 The assistant referee signals for offside against Elliot Benyon. Nick Liversedge takes the indirect free kick. 69:57 Substitution Tim Sills on for Wayne Carlisle. 69:57 Substitution Elliot Benyon on for Scott Rendell. 69:57 Daniel Hall concedes a free kick for a foul on Scott Rendell. Nicky Wroe restarts play with the free kick. 69:21 Effort from outside the box by Jake Thomson goes wide right of the target. 68:23 Assist by Wayne Carlisle. 68:23 GOAL - Chris Zebroski:Torquay 4 - 0 Darlington Chris Zebroski scores a headed goal from inside the six-yard box. Torquay 4-0 Darlington. 67:29 Jake Thomson takes the outswinging corner, save by Nick Liversedge. Wayne Carlisle takes a shot. 67:04 Mor Diop gives away a free kick for an unfair challenge on Adam Smith. Direct free kick taken by Kieran Charnock. Correction - 65:06 Scott Rendell takes a shot. Nick Liversedge makes a save. Wayne Carlisle produces a right-footed shot from deep inside the six-yard box which goes wide of the right-hand upright. Outswinging corner taken by Jake Thomson from the right by-line. 65:06 Scott Rendell takes a shot. Save made by Nick Liversedge. Wayne Carlisle has an effort at goal from close in which goes wide right of the target. Outswinging corner taken by Paul Harsley. 63:37 The ball is delivered by James Collins. 62:45 Substitution Mor Diop on for Lee Thorpe. 60:46 Paul Harsley has an effort at goal from just outside the box which goes wide of the right-hand post. 60:08 Centre by Jeff Smith, clearance made by Nicky Wroe. 58:43 Jonathan Hogg challenges Chris Zebroski unfairly and gives away a free kick. Adam Smith restarts play with the free kick. 58:29 Josh Gray produces a cross, save by Michael Poke. 57:33 Corner from the right by-line taken by Jake Thomson, Dan Burn makes a clearance. 56:49 Unfair challenge on Adam Smith by Jonathan Hogg results in a free kick. Free kick crossed right-footed by Jake Thomson from left wing, clearance made by Dan Burn. 56:34 The ball is sent over by Jake Thomson. 56:07 Wayne Carlisle crosses the ball, Dan Burn manages to make a clearance. 52:55 The ball is sent over by Chris Zebroski, Jonathan Hogg manages to make a clearance. 50:50 Wayne Carlisle challenges Stuart Giddings unfairly and gives away a free kick. Nick Liversedge takes the direct free kick. 49:31 Gary Smith fouled by Chris Hargreaves, the ref awards a free kick. Direct free kick taken by Nick Liversedge. 47:33 Booking Paul Harsley goes into the referee's book. 46:25 Free kick awarded for an unfair challenge on Chris Hargreaves by Paul Harsley. Adam Smith takes the direct free kick. 45:24 Scott Rendell fouled by Gary Smith, the ref awards a free kick. Free kick taken by Wayne Carlisle. The referee blows for offside against Jake Thomson. Nick Liversedge takes the free kick. 45:00+3:32 The referee calls an end to the first half. 45:00+2:14 Chris Hargreaves provided the assist for the goal. 45:00+2:14 GOAL - Scott Rendell:Torquay 3 - 0 Darlington Scott Rendell finds the net with a headed goal from close in. Torquay 3-0 Darlington. 45:00+1:02 The referee blows for offside against Lee Thorpe. Lee Mansell restarts play with the free kick. 45:00+0:17 Free kick awarded for a foul by Lee Thorpe on Chris Robertson. Direct free kick taken by Michael Poke. 44:31 Booking The referee shows James Collins a yellow card for dissent. Correction - 41:35 Jake Thomson delivers the ball, save by Nick Liversedge. Correction - 41:35 Substitution Ian Miller leaves the field to be replaced by Josh Gray. 41:35 Substitution Josh Gray joins the action as a substitute, replacing Ian Miller. 39:39 The referee blows for offside. Direct free kick taken by Nick Liversedge. 38:23 Jeff Smith takes a outswinging corner to the near post, save by Michael Poke. 38:16 Jeff Smith produces a cross, Kieran Charnock manages to make a clearance. 37:55 Jonathan Hogg fouled by Scott Rendell, the ref awards a free kick. Direct free kick taken by Daniel Hall. 37:22 Long range shot by Lee Thorpe goes wide right of the net. 34:32 Corner taken by Chris Robertson, clearance made by Ian Miller. 33:26 Scott Rendell takes a shot. Save made by Nick Liversedge. 32:47 Jeff Smith has an effort at goal from the edge of the box that misses to the right of the target. Correction - 32:01 A cross is delivered by Jonathan Hogg, Close range header by Lee Thorpe goes over the crossbar. 31:34 Corner taken by Jonathan Hogg, Jonathan Hogg sends in a cross, Lee Thorpe has a header from inside the six-yard box and clears the crossbar. 30:18 The assist for the goal came from Chris Zebroski. 30:18 GOAL - Wayne Carlisle:Torquay 2 - 0 Darlington Wayne Carlisle scores a goal from inside the six-yard box to the bottom left corner of the goal. Torquay 2-0 Darlington. 29:29 Jake Thomson delivers the ball. 28:59 Centre by Stuart Giddings. 28:29 Unfair challenge on Gary Smith by Jake Thomson results in a free kick. Direct free kick taken by Nick Liversedge. 27:54 Jeff Smith gives away a free kick for an unfair challenge on Scott Rendell. Free kick crossed by Lee Mansell, clearance made by Dan Burn. 26:06 Chris Zebroski takes a shot. Save by Nick Liversedge. 24:54 Ian Miller gives away a free kick for an unfair challenge on Jake Thomson. Direct free kick taken by Jake Thomson. 24:00 Corner taken left-footed by Jeff Smith from the left by-line, Chris Zebroski makes a clearance. 22:54 Jeff Smith produces a left-footed shot from the edge of the area and misses to the left of the goal. 20:40 Unfair challenge on Gary Smith by Scott Rendell results in a free kick. Paul Harsley takes the direct free kick. Corner from the left by-line taken by Jeff Smith, The ball is delivered by Dan Burn. 19:14 Jake Thomson concedes a free kick for a foul on Gary Smith. Nick Liversedge takes the free kick. 18:31 Substitution Dan Burn on for Mark Bower. 16:42 The assist for the goal came from Scott Rendell. 16:42 GOAL - Chris Zebroski:Torquay 1 - 0 Darlington Chris Zebroski fires in a goal from just inside the area high into the middle of the goal. Torquay 1-0 Darlington. 15:21 A cross is delivered by Kieran Charnock. 14:36 Jonathan Hogg takes a outswinging corner from the right by-line played to the near post. 12:13 Wayne Carlisle gives away a free kick for an unfair challenge on Stuart Giddings. Stuart Giddings takes the direct free kick. 11:42 Chris Robertson takes a shot. Mark Bower manages to make a clearance. 11:12 Lee Thorpe is flagged offside by the assistant referee. Indirect free kick taken by Lee Mansell. 10:33 Jake Thomson takes the inswinging corner, clearance by Stuart Giddings. 10:23 The ball is crossed by Chris Zebroski, clearance by Gary Smith. 9:32 The assistant referee signals for offside against James Collins. Free kick taken by Michael Poke. 6:46 Wayne Carlisle has an effort from just inside the box that misses to the left of the goal. 5:59 Lee Thorpe is adjudged to have handled the ball. Free kick taken by Michael Poke. 4:04 Jake Thomson takes a shot. Save by Nick Liversedge. Outswinging corner taken right-footed by Jake Thomson from the right by-line, Jonathan Hogg makes a clearance. 3:51 The ball is crossed by Wayne Carlisle. 2:34 Chris Zebroski fouled by Mark Bower, the ref awards a free kick. Jake Thomson crosses the ball in from the free kick, save made by Nick Liversedge. 2:02 The assistant referee signals for offside against James Collins. Michael Poke takes the free kick.